Somebody whose opinion I really value, just told me that my blog is about "men fighting" after seeing my first three posts. While I really do care about responsible free speech and will always aggressively defend it; enough about censorship and moderator abuses and let's move on. I find the notion of "A Rising Asia" interesting, and I think it presents a major opportunity for the localization and translation industry in the years to come. I was first introduced to this concept many years ago by Nick Kristof and Sheryl WuDunn in their excellent book, Thunder from the East. (They were also among the first to point out the promise of China/Rising Asia, several years before the "experts" did.) I really liked the book because it also quickly provided an economic history of the world and is a very easy read. I thought it would be good to update and expand upon an article I wrote for GALA a little while ago. I have been surprised how little real awareness there is even in the localization industry where leaders often equate Asia with China & Japan (CJK). This was really brought home at the #LTBKK conference, when I saw what a revelation Biraj Rath's excellent presentation on the Indian localization market opportunity was, to many industry experts. LISA, to their credit announced an India Forum shortly after the conference. - The Internet has very low penetration thus far. Multilingual content will very likely play a key role in driving increasing penetration and commercial opportunity. Asia is extremely diverse, economically and culturally, but yet there are some strong common elements. It is also much less connected than Europe. Today, we are aware of the current economic momentum that India and China have, historically they both also had a deep and lasting cultural influence on much of Asia. An awareness of this history is very useful in developing effective business strategies for different countries. 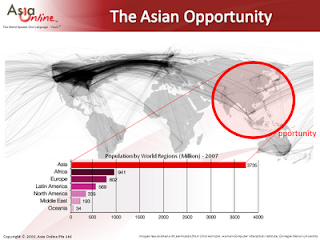 The internet is only just beginning to take root in much of Asia (18% vs. 73% for North America), however, it is expected that almost half of all Internet users will be Asian by 2013. Already, China has more people online than the US. Asia could be a major opportunity for companies that learn to tap into this new emerging online population. But this will require an understanding of the diversity and characteristics of the various segments and will also need new approaches in communication and marketing. Asian economies continue to rise in importance and growth, as both a supplier and consumer. Today China and India are the largest mobile phone markets in the world. Some interesting and perhaps less known facts about Asia that provide a useful contrast to Europe are shown below. They also give one a sense for the different type of opportunities available and the differing reality of Asia. -GDP per Capita in Asia (~$15,000) is less than half of the EU average and there is a much wider standard distribution and a large population living in poverty throughout the continent. -While India and China are among the fastest growing economies in the world, the GDP per Capita is $2,800 for India and $6,000 for China and they should still be considered developing economies. -The top GDP/Capita countries (2008) in Asia are: Singapore ($52K), HK, Japan, Taiwan, South Korea ($23K), Malaysia, Kazakhstan and Thailand ($8.5K). -India has 22 official languages that are as distinct and different as the 23 EU languages, and also include at least 6 different scripts. English is only spoken by about 7% of the people in India. However, it is possible to get deep penetration into the Indian market with 5 key languages. -There is very little local language content for Asian languages on the web in general. Based on a survey done by Asia Online in 2007, less than 15% of the total content on the web is in Asian languages. Almost 90% of the Asian language content is in Chinese and Japanese. There is huge need for more local language content all over SE Asia. -China is now the fastest growing patent office in the world. The WIPO and others state that China is clearly an emerging scientific and technological power. -The share of Asian country based patent filings is now in excess of 50% of all patents filed across the world. -India has more gifted and talented students in high school than the total school student population in the US. -China has more students in Science and Technology college degree programs than India and the US combined. -McKinsey has identified a “Rising Asia” as a stable long term trend that will fundamentally change consumption patterns. Gartner suggests using IT to reach the market. They suggest that global companies use IT to ‘lighten’ their Asian business model to address the specific cultural, geographic reach, and supply chain considerations. -The wealthy Asians are concentrated in major cities like Shanghai, Beijing, Hong Kong, Singapore, Kuala Lumpur, Mumbai, Delhi, Seoul, Manila and Bangkok. -China is now the fastest growing market for Bentley and BMW. -More cars are now sold in China than in America. -Even countries like Laos, Nepal, Pakistan, Sri Lanka, Myanmar, and Cambodia which have very low GDP/Capita are interesting markets for cell phones and basic commodities. -An understanding of Buddhism, Hinduism and Confucianism cultural perspectives can dramatically enhance your communications strategy into most parts of Asia. -The fastest growing FaceBook markets in 2H2009 are Taiwan, Indonesia, Philippines and Thailand. -Google is not dominant in key Asian markets, in Korea they have less than 2% search market share and they are a distant second in China and Japan. Maybe even completely out of China soon. Local companies dominate because of better understanding of local content, language and customer preferences. This suggests that standard US approaches may not work as well in many Asian markets. -Chinese social networking startups have produced many innovations that have led to them becoming profitable much faster than US equivalents like MySpace and Facebook. We are now seeing Asian innovation gradually making its way to the west. -Most of Asia has been relatively unscathed by the global financial and real estate market collapse. -India is increasingly considered a "soft power". Influential culturally way beyond it's direct sphere of influence. -The venture capital markets in India and China are rapidly developing with help from "returning" entrepreneurs and hostile US immigration policies. But simple strategies like simply making your web content available in the local language may not work. Asian cultures may look superficially similar and even western on the surface, but can have deep cultural differences. The localization market is estimated to be $1.5B in 2010 and could grow dramatically. 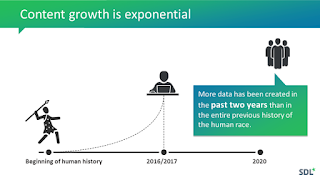 My sense is that those numbers miss much of the impact of recent growth as the Facebook trends show, mobile computing and successful bottom of the pyramid marketing strategies. All of these factors point to fundamental shifts in the global economy and indicate that many of these trends will accelerate further. Asia is a significant opportunity for informed globalization managers -- and probably key for long-term leadership for many global enterprises. Global companies need to develop broad and unique country-specific strategies to be able to prosper and thrive in this rapidly changing world. Localization and translation will be key elements of any successful globalization plan and should present significant opportunities to vendors that prepare for this change. It's wise to remember that the Chinese ideogram for "change" can also mean "opportunity." India and China are experiencing very high growth in research capability but this has not yet achieved the scale of the G8 competitors. The competition from India and China is more in engineering than science – the science research base in China is not yet a great threat, but will become so – China aims to be at least in the top five globally in terms of science and industrial innovation, with every sign that the target for science at least will be exceeded. India has been described as ‘consolidating its place at the high table of international science’. It has the human capital, the necessary funding and the policy agenda necessary to establish this position. So while the US & UK are currently science and technology leaders, this is changing. Now the bad news: the cost of one chemist or one engineer in the US — and presumably in the UK — is the same as five chemists in China or 11 engineers in India. This week (March 2010)alone, 1,200 redundancies have been announced in research and development by the Leicestershire-based pharmaceutical company AstraZeneca. In the UK we are facing pressure to cut budgets, yet China and India are investing strongly in science and engineering. How on earth are we going to compete — or even survive — in this brave new world? Just saw a blog that points this trend out in the Pharmaceutical market as well. China will be a better market than France and Germany combined! and Brazil is already a bigger market than the UK. Here is another interesting speech by Hans Rosling at TED (Video) where he describes how Asia will rise again and dominate the world economy based on long term analysis of key economic drivers. He does this in a really fun way showing bubbles racing on a graph.